If you didn’t know better, you may think that the Minack Theatre was originally built by the Roman army in 55 BC when Julius Caesar brought his legions across the Channel and settled in the south of England. After all, he was looking for minerals and found them in Cornwall. But the truth could not be further from 55 BC. What’s truly remarkable is that the Minack was the inspiration, creation, hard work and shear determination of one woman, Rowena Cade, who first conceived of the cliff-side theatre in the 1930s to stage “The Tempest”. During the day, visitors can walk down to the 750-seat fully equipped auditorium which has been cut into the cliff-side. In summer, they close the area at 5:00 p.m. to prepare for the evening’s performance. During the winter months, the closing time is earlier. The Coffee Shop and Gift Shop are open during the daytime visiting hours. If you are coming to a performance at the theatre, you can buy simple take-away meals from the Coffee Shop. The Minack Gardens with their sub-tropical rockeries have become a must for gardeners. Here exotic and salt tolerant succulents provide an added dash of colour to the area. 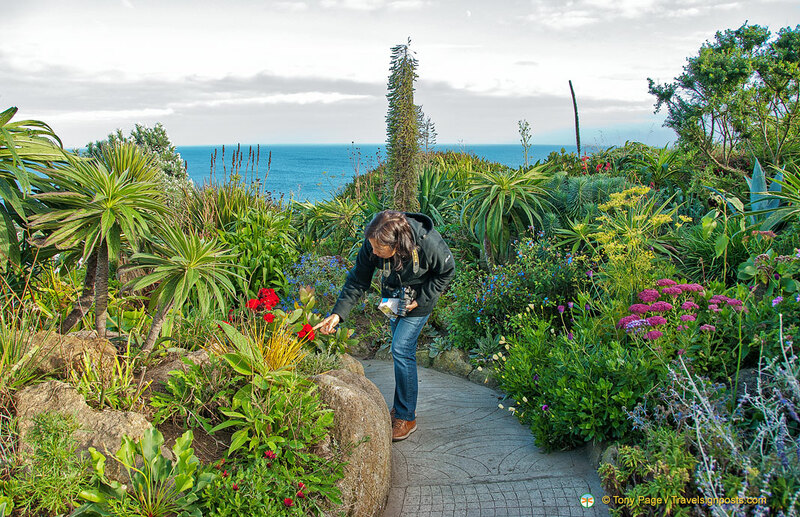 The plant selection and ideas are based on the cliff garden developed here by Rowena Cade in the 1930s. Except for the winter months the succulents thrive despite the wind. Many of the plants that you see can be purchased from the Gift Shop. At the Rowena Cade Exhibition Centre you can read the story of the girl who enjoyed the gentility of Victorian Cheltenham and grew up to build an internationally famous cliff-side theatre with her own hands. Disappointingly, we arrive at 5:00 p.m. and are too late to make the visit down the cliff. Already there are people queuing after 5:00 p.m. and the performance is not due to start till 8:00 p.m. The Gondoliers is playing tonight and tempting as it is to attend this popular Gilbert & Sullivan extravaganza in this atmospheric setting, it wouldn’t have been a wise decision to do so. It was already quite cool in the early evening and the people in the know are arriving with blankets, jackets and windcheaters. Even after a very hot day, temperatures can get quite cool after dark and theatre-goers are advised to bring warm clothes and prepare for any change in weather. There is also the issue of driving back late at night in the unfamiliar, narrow Cornish country roads. Some people arrive by First and Western Greyhound buses which seems an easier and more sensible way to get here for visitors. 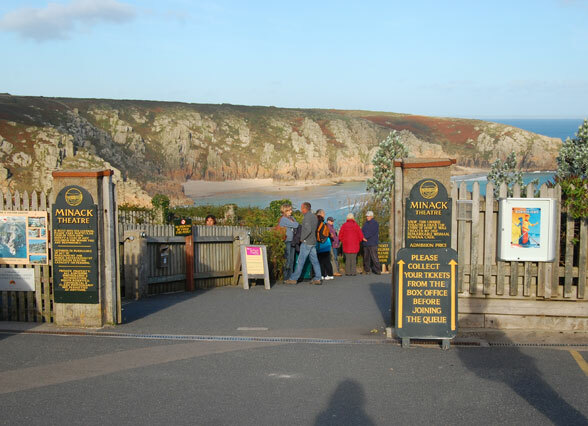 A few travel operators also arrange transport to and from the Minack as well. Well, next time we’re in Cornwall, a Minack Theatre experience is certainly be one of the things on our to do list. See more Minack Theatre photos at Travelsignposts Minack Theatre photo album HERE.